Tahmoh is delighted to have starred as Lieutenant Karl "Helo" Agathon on the Emmy Nominated Sci Fi series Battlestar Galactica for which he has received the prestigious Peabody Award. Prior to Battlestar Galactica, Tahmoh joined the cast of the critically acclaimed Canadian series The Cold Squad for their final season. His performance on that series earned him a LEO award nomination. Tahmoh's next major public production was Joss Whedon's sci-fi series Dollhouse, which was just cancelled after 2 seasons. Tahmoh has also be seen in a Guest Starring capacity in a variety of other series including a recurring Guest Star on Whistler (The N), Smallville (FOX) and The L Word (Showtime ). Tahmoh stars in the short film, Trapped Ashes, directed by renowned director Monte Hellman, which debuted at the 2006 Cannes Film Festival. Tahmoh had two films which came out in 2007, Trick 'r Treat (Warner Bros) and The Green Chain (Movie Central) and debuted at the Vancouver Film Festival. 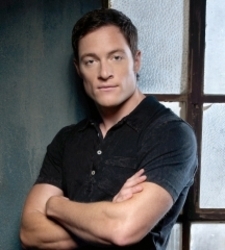 Most recently Tahmoh Penikett played the lead role of Matt Ellman on Syfy's four-hour TV adaptation of Riverworld. Tahmoh was born in the city of Whitehorse in the Yukon, Canada and his background, which includes strong ties to the Upper Tanana tribe and their traditions, led him to his love of storytelling. Tahmoh has a very strong connection and devotion to his family with whom he spends time with whenever possible. In his spare time enjoys a variety of athletic pursuits including being a competitive kick boxer.